Our single person pedal suspended working platform contains a suspension mechanism which can be set up on buildings. Driven by the hoist, the whole suspended platform will move up and down vertically along the steel ropes. 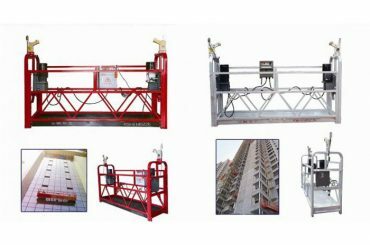 Our single person pedal suspended working platform is an aerial working construction machinery used for curtain wall installing and exterior wall cleaning. This product is suitable for plastering, veneering, painting, cleaning and maintenance of tall buildings and can also be applied in the construction projects of large tanks, bridges, dams, etc. 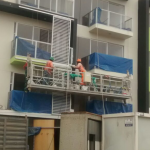 As a replacement for traditional scaffold, our aerial work platform which can be used repeatedly helps reduce labor intensity, increase working efficiency and lower construction cost. 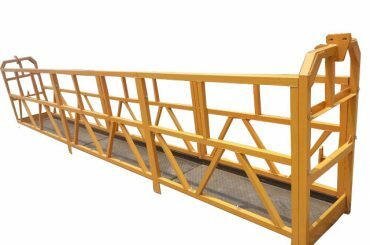 Using our product in construction, the cost is 28% of that using traditional scaffold. 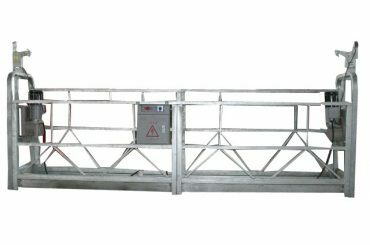 This aluminum alloy suspended access platform features flexible operation, easy movement, utility and safety. 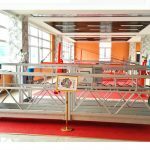 The working platform is a frame-shape steel (aluminum alloy) structure made up of welded parts fastened by bolts. 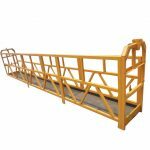 This working platform is used to carry the construction operators and construction materials. a. On the surface there is an oxide film to protect the working platform against rust and corrosion. b. It is 60% lighter than the steel type of the same model. 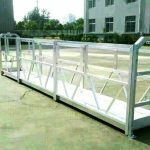 c. With higher rated loading capacity, our aluminum alloy suspended access platform has better anti-tilting performance. d. It is easy to transport and install, saving both labor and time. e. The shining silver gray appearance makes this product look elegant. 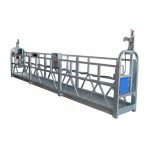 Note: Apart from working platform made of aluminum alloy, we also have plastic powder sprayed steel and the hot dip galvanized steel suspended cages for you to select. 1. 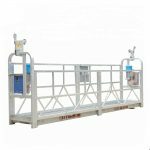 The working platform is designed with length of 1m, 1.5m, 2m, 2.5m and 3m. Customers can select the proper one according to their actual needs. 2. 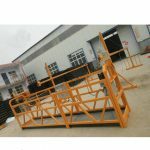 Our company is the first one which adopts raglan welding technology to weld the end of the platform frame. This technology enhances the strength of our suspended cage and makes it safer to use. 3. The bottom plate is 720mm in width with embossed textures. It is easy to install. 4. 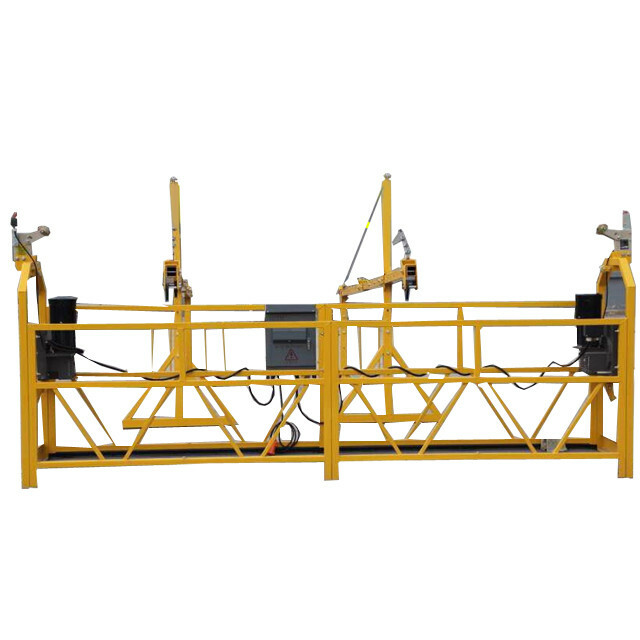 360° turning casters facilitate the movement of the suspended working platform. There is one set of hoist on each side of the suspended access platform. Made of die-casting aluminum (104#, conforming to the national standard), the housing of the hoist is not easy to crack. The rope pulley is made of spring steel and the worm gear is made of 94# tin bronze. All these parts, except the worm gear are heated, blackened and processed with oxidation treatment. The LTD-series hoist which can recover from failure automatically is a new product developed by our company. Through all kinds of tests, it is proved that our LTD-series hoist can recover automatically and go on working when the steel ropes are deformed or bended because of bearing force. In this way, service life of the steel rope is greatly increased. 2. Safety rope: The safety rope, also called life rope, is made from high strength filament and is 18mm in diameter. When the suspended platform rapidly falls due to a fault, the safety rope will tighten to prevent the construction workers from falling. 3. Limit flange: This device will prevent the suspended platform from dashing out when it lifts to the highest level. 4. 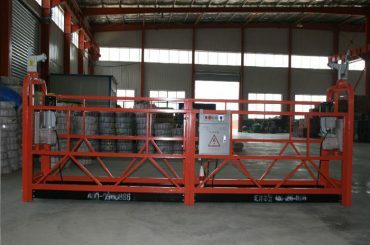 Electromagnetic braking device of the hoist: It will keep the working platform suspended when the electric circuits break down or power supply is cut off. 5. 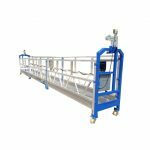 Centrifugal speed limiting device: This device ensures the suspended access platform descending speed not higher than 1.5 times of the rated lifting speed, keeping the platform more stable. 6. 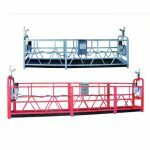 Manual hoist lowering device: In case that power failure or electrical failure happens, users can make the suspended working platform descend and send the workers back to the ground safely using this device. 7. Electrical emergency stop button: Press this button, the main power and control power will be turned off to stop the movement of the platform. The electrical system of our suspended access platform mainly includes the electric cable, transformer, leakage protector and other control switches in the electrical control box. 1. The control panel can be set in Chinese, English, Russian or other languages according to customers' requirement. 2. The socket conforms to the European standard, American standard and other international standards. 3. The electric cable we use is 3×2.5²+2×1.5² cable up to the national standard. With steel core, our electric cable has higher tensile strength and longer service life. 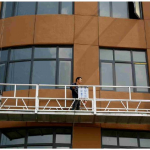 The suspension mechanism of our aluminum alloy suspended rope platform can be set up on the roof of a building. It is composed of two sets of independent steel frames and steel ropes. On each front beam of the steel frame, there are two pieces of steel ropes. One is for lifting the hoist, while the other one serves as the safety rope for the safety lock. 1. The steel rope we use is FASTEN rope, which is specially designed for suspended access platform. Treated with hot galvanizing, the steel rope has high strength and excellent corrosion resistance. 2. The front and rear beam has size of 50×110mm and thickness of 3.75mm. 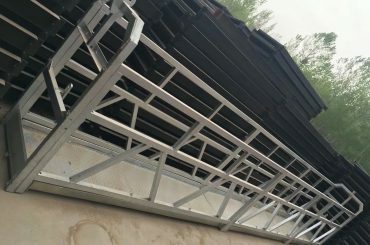 Size of the middle beam is 60×120mm and its thickness is 2.75mm. The rectangular steel frame has higher tensile resistance than the square steel frame. 3. The suspension mechanism can be lifted to 1.98m at most. 4. The front, middle and rear beams have a total adjustable length ranging from 5.2 to 7.6m. Thus this suspension mechanism is able to work on varies kinds of complex floors. 5. Parts of the suspension mechanism are processed with hot galvanizing, thus they have higher corrosion resistance than those processed with painting treatment.